It took Messrs Kiske and Hansen 23 years to get back together but here are UNISONIC preparing to launch their second album. On offer here are two new tracks and four live from the 2012 Masters of Rock Festival in the Czech Republic, which are also exclusive to this release. “For the Kingdom” opens at a pace with a biting riff and a nicely laid keyboard pattern. Playing apart from Kiske and Hansen are as usual Mandy Meyer, guitars, Dennis Ward, bass, and drummer Kosta Zafirou. I´d be a liar to claim that this is a long shot different to HELLOWEÈN, but that will not displease the buyers in this case... You come alive is the lesser track of the new ones, but the voice and the tight unit in the verses does the trick. 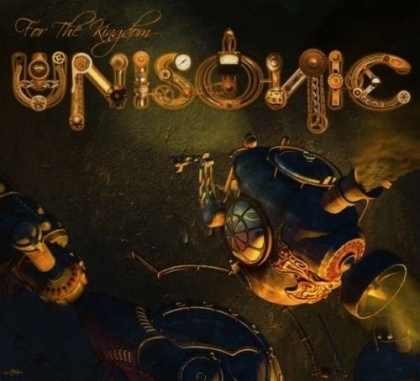 “Unisonic” is the first live track, disappointing no one with a thunder opening, keys and an orchestral part, and a witty riff. Sing-along is only a slight way of putting it and the Czechs were happy. “Never Too Late” lowers the temperature somehow while “Star Rider” makes amends and “Souls Alive” gets the place cooking again with its HELLOWEEN-ish style. I am only partly convinced about this but I have never been one for the polka style German invasion.